In a normally functioning visual system, the two eyes work as a team. A person who has strabismus experiences an eye turn or an eye misalignment that interferes with the skill of eye teaming and causes a functional vision problem. 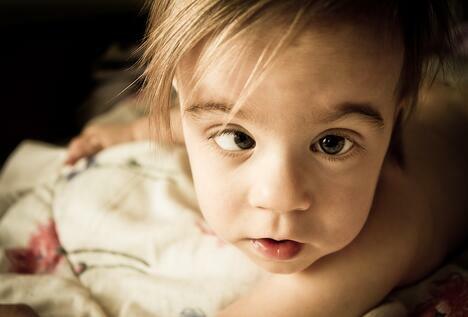 Strabismus is the medical term for what is commonly referred to as ‘crossed eyes’. According to the American Optometric Association, “Crossed eyes, or strabismus, is a condition in which both eyes do not look at the same place at the same time.” It occurs when one or both eyes turn in, out, up or down some or all of the time. Strabismus is a severe problem with eye teaming, one of the three visual skill areas that make up functional vision. Because the eyes are pointing at different places, the brain has difficulty combining the images it sees into a single, 3D image. Strabismus is commonly referred to as “crossed eyes,” but as the definition above indicates, it involves any type of eye turn, not just crossing. 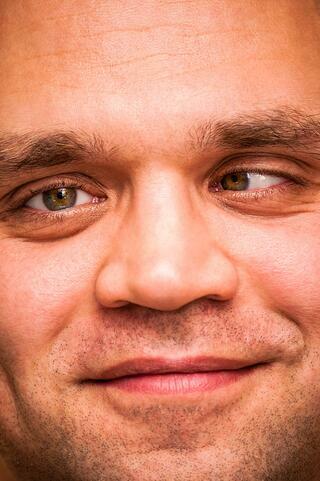 People often confuse Strabismus and Amblyopia (Lazy Eye). The confusion arises from the fact that they are separate, but sometimes related, conditions and a person can have both at the same time. Strabismus is a problem with eye teaming and amblyopia is a problem with eyesight that cannot be improved with glasses. While strabismus can often be noticed upon simple observation of a person’s eyes, amblyopia cannot. For more information about Amblyopia, check out our Amblyopia page. Strabismus results when a person has difficulty developing the visual skill area of eye teaming. Infants learn this skill in the first few months after birth. Learning begins to happen very quickly in the first few weeks of life and then more gradually over several months. It continues over years as the visual skill of eye teaming is integrated with the rest of motor and sensory development. Difficulty in developing the visual skill of eye teaming can lead to double vision. Strabismus is a “solution” to double vision in that if the child is having difficulty aligning the eyes in order to put the two images together they can instead learn to move them farther apart. This makes it much easier to ignore one of the images. The majority of the time the underlying cause of the difficulty of learning to align the eyes is unknown. It may be associated with family history of similar types of eye teaming problems, developmental delays and other visual conditions. 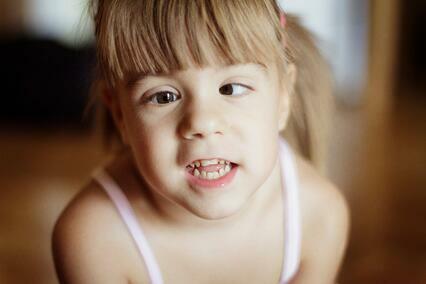 Children - Most strabismus occurs by age 6 and often by age 3, but can occur at any age. It often develops in the preschool years as the child is developing the functional visual skill areas of eye movement, eye focusing and eye teaming and integrating those with both large motor and fine motor skills. Interferences in this development can lead to strabismus. Older Children and Adults - Functional strabismus can occur at any age. Sudden onset should be evaluated immediately (see below). Functional onset in teenagers and adults is often related to increased near visual stress. This could include increased demands for near work related to school or employment. Strabismus can be caused by a problem with one or more of the six eye muscles that move the eye or a problem with the nerve(s) controlling the eye muscle(s). Congenital - In rare cases this can be present at birth. Pathological - Sudden onset can be caused by trauma to the eye muscle or brain, vascular or other pathological conditions. These must be ruled out and/or treated prior to consideration of any vision therapy program. Note that some cases of sudden onset strabismus can signal a life-threatening situation. 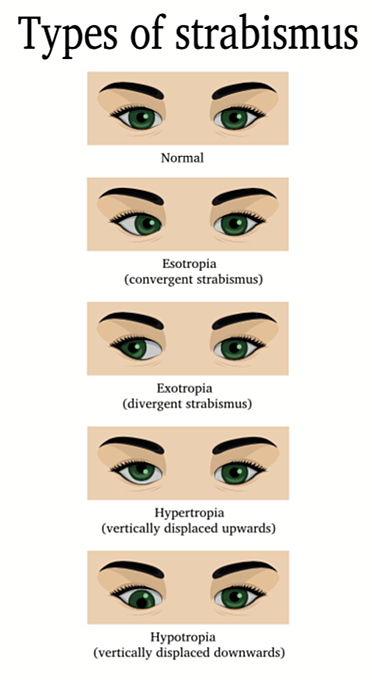 Exotropia and esotropia are the most common types of strabismus. A patient may have any of the above in isolation, but could also have a combination such as one eye pointing inward and down (esotropia and hypotropia). Intermittent strabismus is usually easier to treat. The examination will include evaluating whether the eye(s) turn more when the patient looks far away or close up, and whether there are any other positions that are more difficult such as looking to the left, right, up or down. Additionally, we will want to determine whether there are any factors which trigger the eye turn (e.g. reading, driving, fatigue, etc.). Constant strabismus is more difficult to treat, as it is harder to retrain a visual system if the eyes never work together. The case history is especially important in these cases to determine how long the patient may have had eye teaming before it was lost. Recent onset of constant strabismus in adults (and some children) is often associated with systemic or ocular pathology. Does one eye turn or both? Many people are surprised to learn that most of the time it is better if both eyes are turning as this usually means that the two eyes are functioning fairly equally. Is the turn severe or barely noticeable? How far the eye turns is an important consideration in the treatment program. However, it is important to note that a larger degree of turning is not necessarily more difficult to treat with optometric vision therapy than a smaller turn. All of these factors must be assessed in a strabismus evaluation. When present, a term from each would be used to describe specifically the type of strabismus. The developmental optometrists at The Vision Therapy Center perform a Functional Vision Examination to diagnose strabismus and determine treatment options. Because we are board certified in vision development and vision therapy, we have knowledge and examination techniques that may not be available at other offices. A Functional Vision Examination includes a comprehensive assessment of eye teaming, eye focusing and eye movement. Following the Functional Vision Examination, additional testing (called perceptual testing) may be recommended to assess visual information processing. A Functional Vision Exam generally takes 60 – 90 minutes and the specific tests used in the exam are tailored to the patient’s individual needs. Generally speaking, strabismic patients tend to be less symptomatic than patients who have non-strabismic functional vision problems. The reason is that they often turn off (suppress) the information from the eye that is turning, thus avoiding double vision and the symptoms that go along with it. Patients with constant strabismus are typically the least symptomatic because they suppress an eye constantly whereas patients with intermittent strabismus may be more symptomatic as they suppress an eye intermittently and therefore may experience double vision when not suppressing. Common symptoms of strabismus include: eye strain and/or pain, headaches, blurry and/or double vision, eye and/or general fatigue. Perhaps the most common and well-recognized symptom of strabismus is impaired depth perception. It’s a common misconception that people with strabismus have no depth perception. This is only partially true because there are two types of depth perception. Our visual system is designed to combine the images of each eye into a single image. Because each eye has a slightly different view of the same thing, we experience the perception of depth in three dimensions. This is called binocular (two-eye) depth perception. When strabismus is present, the person does not have binocular depth perception because both eyes do not look in the same place at the same time. They do, however, still have depth perception. Monocular (one-eye) depth perception is a collection of ‘monocular depth cues’ that allow a person to judge distance and depth when only one eye is pointed at an object. One of these cues is occultation - when a nearer object blocks part or all of a more distant object. Many of us have experienced this at church, a ball game or in a theater when the person sitting in front of us is blocking our view. While monocular depth perception helps to inform the person with strabismus about where they are in space, the lack of binocular depth perception often results in poor orientation, clumsiness and poorer performance in sports. Click to download a complete list on signs and symptoms for intermittent strabismus and constant strabismus. Eye turns are fairly common and normal in newborns as they learn the visual skill of eye teaming. But if it persists beyond 3 months of age the child should be evaluated by a developmental optometrist. Vision therapy can be especially helpful for young children as they are still just beginning to learn how to use their vision. An ophthalmologist may recommend surgery at this age, but we encourage you to read the section on strabismus surgery on this page, as well as this infantile strabismus success story. In-Depth Article: Does Fear Drive Parents’ Choice for Strabismus Treatment? Strabismus in adults can be improved or corrected just as in infants and children. Generally speaking, younger people may have faster results, as their visual system is still developing. 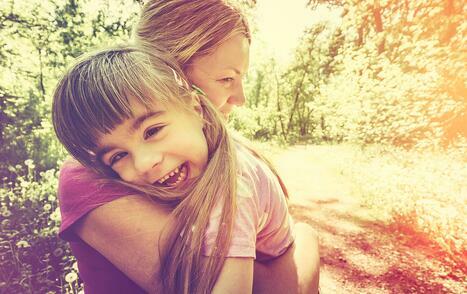 Adults may take longer as they need to change the way they’ve used their vision for many years. However, we’ve seen many adults who have been able to make big changes in a relatively short period of time because the brain’s plasticity allows for visual skills to be developed at any age. 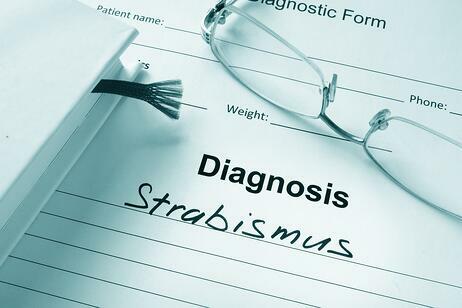 The first step in treating strabismus is to ensure that the patient has the best glasses prescription. Our doctors use specialized testing to confirm that the patient’s prescription minimizes visual stress and maximizes visual function. In cases of accommodative esotropia, the right glasses prescription can actually reduce or eliminate the eye turn when they are worn. Depending on the patient’s goals, vision therapy may be recommended to treat the strabismus. There are two types of cures for strabismus: functional and complete. A functional cure for strabismus means that the patient’s symptoms will be reduced or eliminated, but the strabismus itself may remain. The prognosis for a functional cure is generally very good in most cases of strabismus. A complete cure is eliminating the strabismus all or part of the time and establishing binocular vision. The prognosis for a complete cure varies based on a number of factors, most importantly the type of strabismus. Generally speaking, a complete cure is more difficult to achieve and therefore takes longer. Our doctors take time to discuss all of the treatment options available to the patient at the conclusion of the Functional Vision Exam. Using lenses, prisms, specialized equipment, techniques and exercises, patients go through the process of binocular vision development. The patient works one-on-one with a trained therapist once a week in a 45-minute therapy session. In addition to the in-office activities, the patient will complete home therapy activities for approximately 20 minutes a day, 5 days a week. A typical program of therapy for strabismus lasts 9 months, with additional sessions recommended in some cases, based on progress. In some cases, vision therapy alone may be the best treatment and in others a combination of therapy and surgery may be the best approach. In every case, it is best to start with vision therapy, as it is a non-invasive treatment. After completing therapy, if it is determined that surgery would be helpful, the patient will have developed significant control of the way they use their vision which will help them to organize it after the surgery. Strabismus may have a hereditary component, but that’s not always the case. How Long Does Strabismus Treatment Take? Duration of treatment varies based on the type of strabismus and response to the treatment. The best way to have an estimate of how long it will take to treat a specific case is to get a Functional Vision Test. Are There Eye Exercises for Strabismus? A developmental optometrist will direct the activities that are to be performed in the office and home on a weekly basis. How do I Schedule a Functional Vision Exam? Fill out the form below to schedule a Functional Vision Exam.